Before seeing Arbitrage, I looked up the definition of the title, which refers to the practice of buying something in one place and selling it in another because it’s worth more. After seeing the film, this didn’t make much sense. Then I came upon a second, lesser known definition, which is “an authoritative decision or exercise of judgment.” This latter meaning is what writer-director Nicholas Jarecki must have had in mind when he made this sharp, intelligent thriller, which takes place in a world where authoritative decisions are made every day, even though they’re not always the right ones. 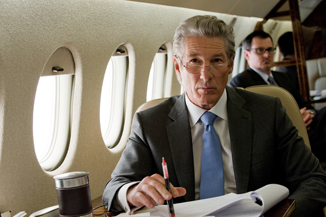 In Arbitrage, the man making most of the decisions is Robert Miller (Richard Gere), who owns a highly successful trading firm in New York City - or at least it seems successful. It would also seem Robert has an all-around perfect life - he’s just made the cover of Forbes magazine at the age of 60, though he hardly looks that old; he’s happily married to Ellen (Susan Sarandon), a charitable woman by day and even more patient wife by night; he’s business partners with his smart, moralistic daughter, Brooke (Brit Marling); and he’s on the verge of selling his company, which will more or less allow him to retire a billionaire. We come to learn Robert’s business is not doing so well after all. He recently gambled on a foreign copper company and lost badly, a blunder that would cost his investors millions and God knows how many people their jobs. But rather than own up to his mistake, he fraudulently covers it up by borrowing money from a friend to temporarily plug the hole. He’s hoping the sale of his company will clean up the mess for good, but until it goes through and a pending audit from the IRS passes, he must hide his desperation. That’s not the only thing Robert is hiding. He also has a French mistress named Julie (Laetitia Casta), an up-and-coming artist who wants Robert all to herself but knows deep down he’ll never leave his wife. For Robert, it boils down to preserving a respectable image for his business and those under him.